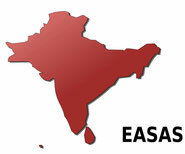 We welcome new members to EASAS. The constitution can be found below with full details of membership rights and obligations. Any individual interested in supporting the objectives of the Association can become an ordinary member, irrespective of residence and nationality. Associations and corporations, irrespective of their domicile or administration, can also become supporting members, if they wish to assist the Association in meeting its objectives, on payment of annual membership fees. The precondition for membership is a written application addressed to the Council of the Association (see pdf below). Payment of the first membership fee is due on receipt of an invoice, sent to all members by our membership administration. The application form below should be used. On applying, applicants, or an authorized representative in the case of associations and corporations, declare that they will adhere to the terms of this Constitution by supplying their name and address. A member is accepted as soon as the completed membership application and the first membership fee have been received. for students and the unemployed €20.00*. The membership fee is due on the first day of January or for a new member at the start of their membership. If you would like to become a member, please fill in the application form and email it to office@easas.eu. Important: Please be aware that your membership with EASAS is renewed automatically and does not expire on its own. If you wish to leave the Association, you have to cancel your membership through a written form. Termination is only possible at the end of a calendar year and premature termination is explicitly excluded. SEPA debits are taken as standing orders (annually). EASAS wants to provide its members residing outside of Germany with the opportunity to have payment options other than bank transfer, since an international transaction is expensive due to the bank fees charged by the participating financial institutions. On this account, credit card payment is also possible within the Single Europe Payment Area (SEPA) provided your bank is not part of the SEPA Agreement. If you want to conduct Membership Fee payment via a SEPA authorization, please make sure your bank is part of SEPA in a preliminary stage to avoid complications. You can find a list of countries taking part in SEPA here (EASAS does not guarantee the accuracy of this information, which is liable to change). Please note: all relevant information about your EASAS membership can be found on your payment documents (including your membership number). Please store these documents digitally or as a hard copy and retain them for your reference. The Application Form can only be accepted if filled out in full and forms with incomplete details will be rejected. Please note that signatures must be by hand, as digital signatures will not be accepted. *Those who wish to join as student members should include evidence of their status, e.g. a letter from their supervisor, or a photocopy/scan of their student card, with their membership application form. Student members need to provide evidence of their student status at least once a year.